HTC One M9 to support band 12 and band 2 LTE? This is another reason I think TMO's Uncarrier 9 announcement on May 18th is going to be about 700Mhz band A phones that helps improve VoLTE and Wi-Fi calling. TMO: HTC One M9 to support band 12 and band 2 LTE? That'll be good news if it's true. Will you be getting the M9 when it's released? I am looking at all phones with this 700Mhz Block A support that is my trigger point. I want to replace my Nexus 5 but I will wait for reviews from Android Central before I make any decisions on which phone I get. The Nexus 6 should get the 700Mhz Block A support when they roll out Lollipop 5.1.0 that is rumored to start rolling out by mid-May. I will also look at the S6 if it has the 700Mhz support. I have seen the S6 has just got FCC approvals and hope it will support Block A but I can't find any leaks about it. The biggest hint the S6 is going to have Block A support is TMO is also rolling it out on it's MVNO Metro PCS. I won't get the Samsung Avant that has the Block A support coming since it has a small 4.5 screen. I am in the process of mapping T-Moble's 700Mhz and other spectrum towers in my area to help justify me replacing my Nexus 5. Check out the TMO's towers I have added in the last two weeks. That would be a waste. They don't gave enough 700mhz running yet, to make an uncarrier move about compatible phones. How do you know they don't have enough 700Mhz for it to be a waste? I have found a few 700Mhz towers in my Area where there are millions of people. Also, on another TMO message board that I have been reading (Howards Forum) they seem to have quite a bit of 700Mhz rolled out around the country where people are taking pictures of the towers and posting them. Howards Forum has a lot of people in the cell tower business and can look at a picture of the antennas on the tower and tell you which cell service provider it is and what spectrum band it is supporting. T-Mobiles greater issue in my opinion is not enough cell phones that support their new 700Mhz spectrum. Unless you have a Note 4 or Note Edge then there are no other phones that support that spectrum today. T-Mobile has been rolling out 700Mhz since at least August 2014. Correct March 18th my bad. Still think this is about the new 700Mhz spectrum and to introduce the new phones that supports that spectrum. Looks like HTC will make a separate version of the M9 that will only be sold by T-Mobile -- OR -- Band 12 is a software update by HTC to it's radio support that would by an FCC filing (ID NM80PJA120) is anything to go by. This story tell more detail but TMO has already said the M9 will be sold with band 12 by TMO. 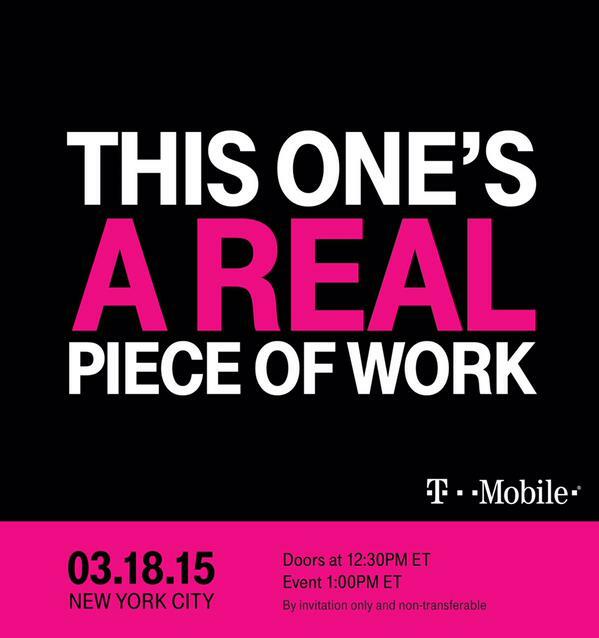 I don't think the uncarrier event will about phone band support. That would be a waste of an event. NOTE the 1st line is the M9 Band 12 Block A - with " Lower Frequency in Mhz = 699.7" and " Upper Freq in Mhz = 715.3"
Does this mean if I choose to purchase directly from HTC I'd be alright? No idea. HTC hasn't even giving the release date for the M9 in the USA. However if you buy a M8 from HTC direct it forces you to pick a carrier provider since it has separate model numbers for each carrier. Surprising since AT&T is already in the midst of deploying Band 12 advertisements (Band 12 is actually the ABC blocks, Band 17 is BC only). That also means we're still waiting for the FCC docs for the Sprint and Verizon versions. And USCC said they might skip it. Unlikely. If nothing else, you'd be missing T-Mobile's WiFi Calling feature. And you'll probably be missing one or more bands you'll need here anyway. Damn I'd like to avoid carrier bloatware that's why I'd love to pick it up straight from HTC. T-Mobile devices include minimal bloatware anyway, all the T-Mobile apps can be uninstalled (not just disabled) except for the Lookout security...Lookout can be completely disabled at least, but can't be uninstalled. How do I unlock my LG Optimus L70? How do I make my phone USB compatible with my car stereo? Why don't I have an option to close a tab? Why can't I connect a Gear 2 Neo to my S5?